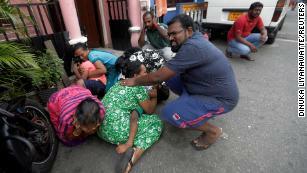 (CNN) The bombings on Easter Sunday of eight sites in Sri Lanka, including three churches, seemed designed not only to inflict mass casualties but also to send a message. Initial investigations showed the chain of bombings was carried out by “a radical Islam group,” perhaps as retaliation for mass shootings in March at two mosques in Christchurch, New Zealand, Sri Lanka’s state defense minister, Ruwan Wijewardana, said Tuesday. ISIS has reportedly taken credit for the slaughter in Sri Lanka but did not immediately offer proof of its involvement. To some, the bombings, carried out on the holiest day in the Christian calendar, has fed a narrative of religious war. Christians and Muslims, this theory goes, are increasingly at odds and willing to strike at each other’s spiritual hearts — sanctuaries. To be utterly clear: Any attack on any house of worship is heinous and should be unequivocally condemned. In too many parts of the world, Christians are attacked by Muslims and vice versa. But taking the long view, the data on terrorist attacks does not support a narrative of incipient religious war or sanctuaries facing increasing threats. From 1970 to 2017, attacks at houses of worship comprised just 1.45% of all terrorist attacks worldwide, according to the National Consortium for the Study of Terrorism and Responses to Terrorism(START) at the University of Maryland. Nearly 300 people have now been confirmed killed in the Easter attacks in Sri Lanka. And several sources are now suggesting a domestic Muslim Islamist group may have been linked to the atrocity – although no group has yet claimed responsibility. Sri Lanka’s Muslim community is spread across the country, but they make up 9.7% of the island’s population. Even though most Sri Lankan Muslims are Sunni, it is a diverse community, with some following the mystical form of Islam, Sufism. Linguistically, most have Tamil as their mother tongue, often leading them to be categorised as part of the island’s Tamil minority, alongside Hindus and Christians. There are, however, Muslims who speak the majority Sinhala language. The origins of Sri Lanka’s Muslim community can be traced back to the historic trading routes between South and Southeast Asia and the Middle East. Traders from the Middle East (Arabs and Persians) developed commercial interests in southern India in the seventh century, which also spread to Sri Lanka. These Middle Eastern merchants married Tamil and Sinhalese women and settled in the east of the island around Batticaloa and Ampara. The Portuguese, who started to control Sri Lanka in the 16th century, used the term “Moor” to describe the island’s Muslims (as they did other Muslim communities they encountered throughout the world). As a consequence, a local “Moorish” identity was established. In the early 20th century, some Muslims promoted this as a unique “Ceylon Moor” racial identity (the island was called Ceylon during the colonial period). They presumed an Arab heritage, which distinguished them from the local Tamil community, which has its origins in southern India and northern Sri Lanka. BOSTON (RNS) – Six years after the deadly Boston Marathon bombing, a local mosque continues to host an annual blood drive in honor of those affected by the terror attack. Monday’s 123rd running of the Boston Marathon marked the sixth anniversary of the attack, which left three people dead and more than 260 injured, as well as the first time the marathon was run on the exact anniversary of the bombing. At 2:49 p.m. — six years to the moment when the first bomb exploded at the finish line – the Boston Athletic Association held a moment of silence, and the bells at nearby Old South Church were rung. Days after the race, as they have for six years, members of the Baitun Nasir Mosque in suburban Sharon, Massachusetts, collected more than 30 blood donations on Friday at Boston City Hall. “(Our community) holds this special blood drive every year to honor those affected by the Boston Marathon tragedy, help humanity and to emphasize true Islam’s teaching regarding the sanctity of life,” organizer Nasir Rana said. “We want to tell the people that the only blood Muslims shed is to help humanity,” he said. Night falls in the ancient city of Harar, and I’m witnessing a breathtaking, if not bizarre, exercise. A young man skewers chunks of meat onto stick, holds the stick in his mouth, and then proceeds to feed a number of hyenas who emerge from the darkness, their eyes glowing as they step into the light. The spectacle goes down a treat with the assembled tourists. “I do this because I like animals,” Biniam Ashenafi explains. The 32-year-old is one of several local volunteers who feed the scavengers on a daily basis. “We don’t call them hyenas. We call them young priests. Every new year in the Arabic calendar, we have a porridge feast for them in the four corners of the city. For centuries, people in Harar have lived side by side with hyenas – one of the world’s deadliest land predators. The city’s fortified walls, built between the 13th and 16th Centuries, even have small holes in them to allow the hyenas to enter the city at night. (RNS) — Since President Trump tweeted a provocative video juxtaposing clips of Rep. Ilhan Omar and the falling Twin Towers, Omar has faced a surge of criticism along with direct threats of violence, both online and offline. But how did a video of Omar’s comments on the 9/11 terrorist attacks, part of a speech about how Muslims should not lose their civil liberties because of the actions of extremists, explode into such a massive controversy? Credit a controversial Australian imam, little known in the U.S. until now. For three weeks, the contents of Omar’s 20-minute speech at a Council on American-Islamic Relations fundraising banquet last month went virtually unnoticed. Crenshaw didn’t appear to have come across the clip on Fox News, which broadcast the entire speech live, nor did he seem to have come across it on a right-wing blog or news site. Crenshaw had actually retweeted a post by Australia’s Imam Mohammad Tawhidi, who had uploaded a clip of Omar’s speech to Twitter and claimed that her speech minimized the 9/11 terrorist attacks.